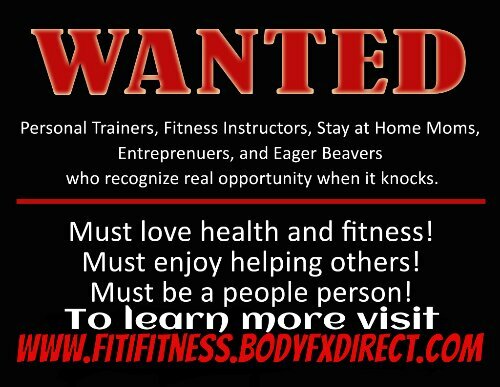 Are You Passionate About Fitness & Wellness? Do you love motivating and helping others achieve their fitness and wellness goals? Would you enjoy working from home or mobile office? Are you a people person? Would you like to supplement your income while helping others? Are you a team player, no drama, help others to help yourself, visionary type of person? If these questions describe you, contact me today! This is a ground floor opportunity right now so the market is WIDE OPEN and you control your success. We have a supportive team that will provide you the tools and support you need to be as successful as you want to be! Go to http://www.fitifitness.bodyfxprelaunch.com to watch a short video and reserve your spot before we launch!